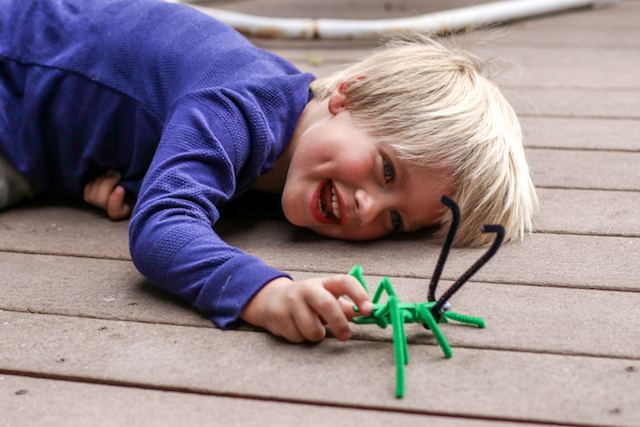 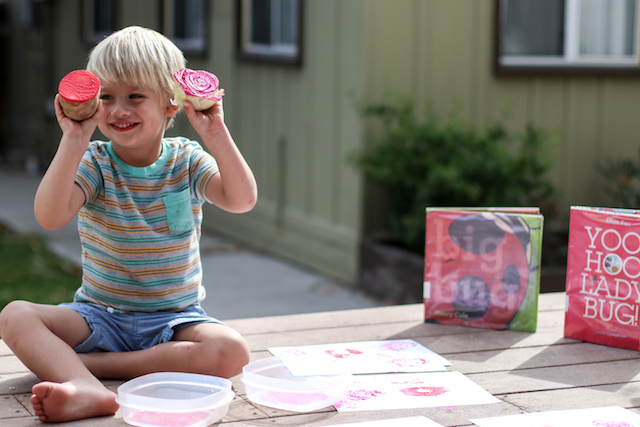 Everett has never been a kid who was particularly into bugs, but this year that has changed. 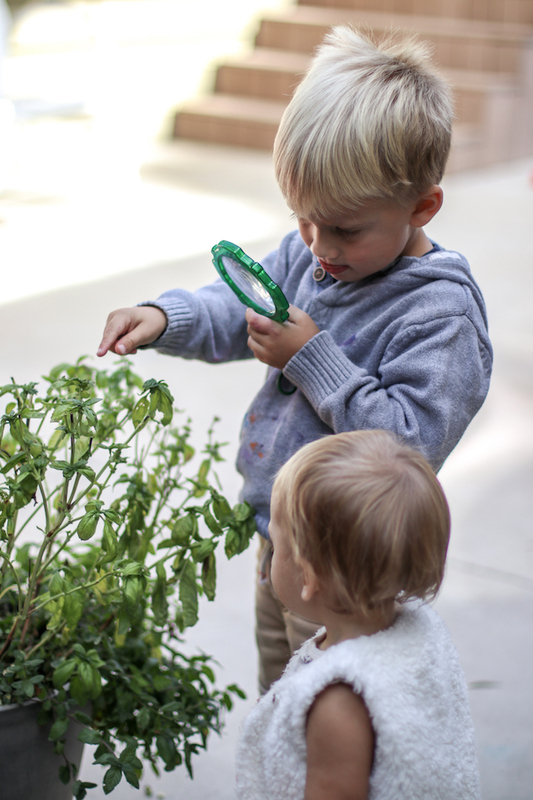 Bugs have definitely been a central theme in our school lessons throughout the year, because of Everett's curiosity. 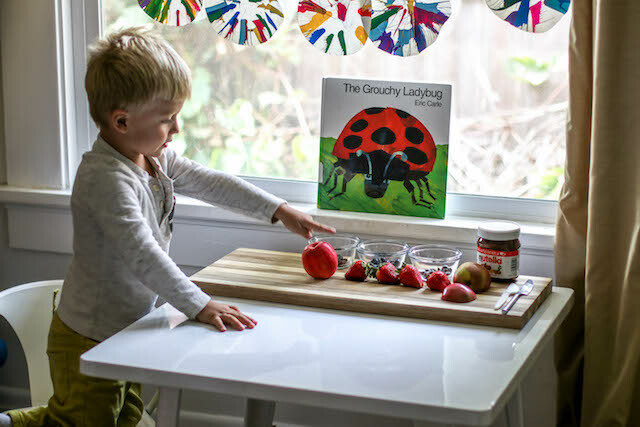 In all my life, I have never been interested in bugs either, but I have a new appreciation and love for them after studying them with Everett. 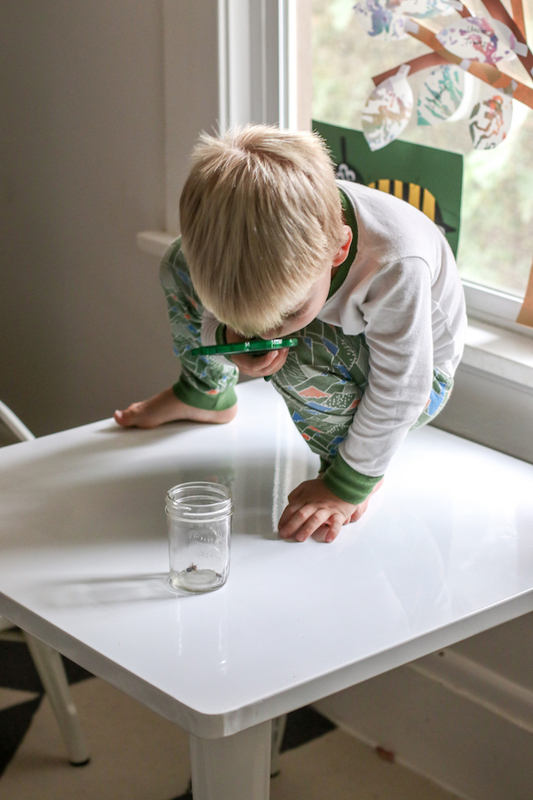 One of the lessons Everett has taught me this year is that he doesn't need any adult to encourage his curiosity. 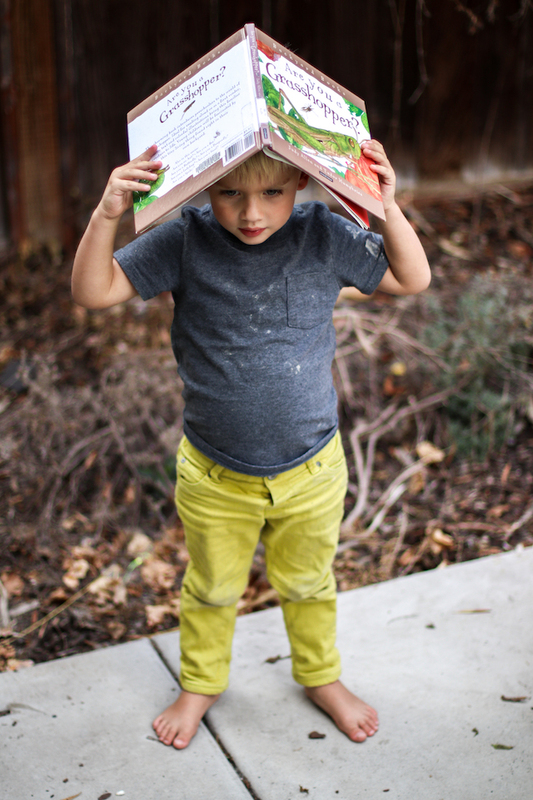 I just need to let Everett be a kid and follow his lead. 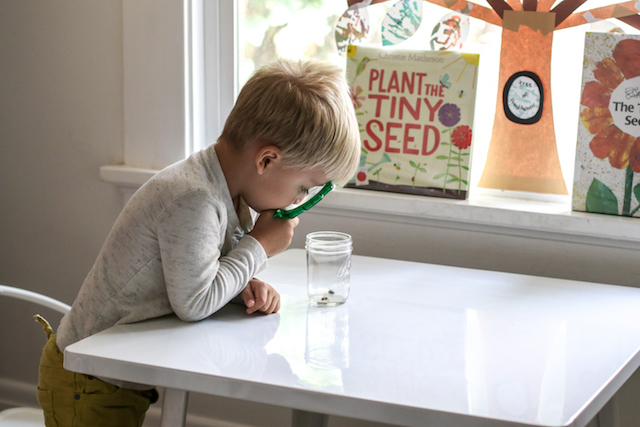 All of these lessons were sparked by Everett exploring our yard and wanting to learn more about what he found, specifically bees, "grasshoppers," and ladybugs. 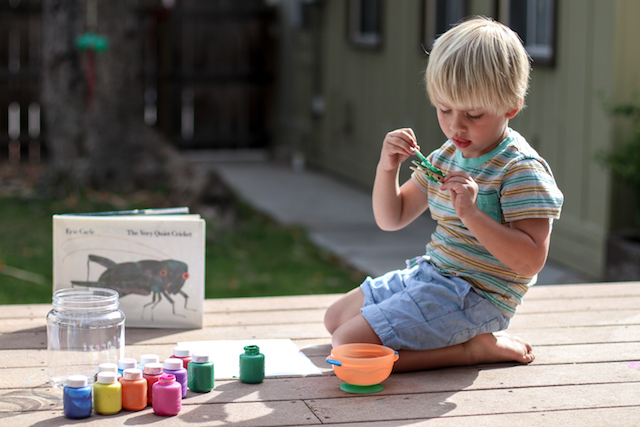 First, Everett found two dead bees in our backyard, so he wanted to keep them in a jar and study them. 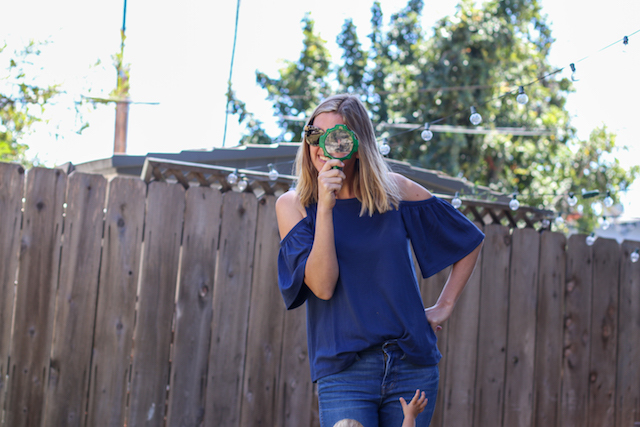 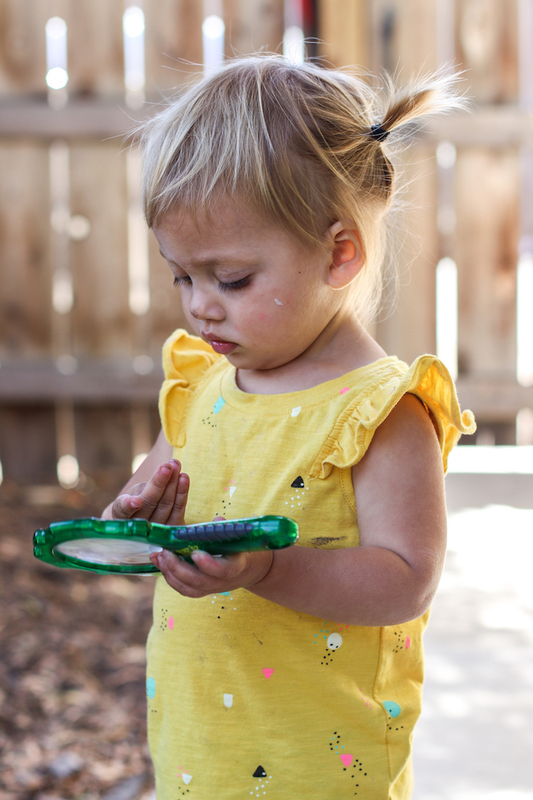 I purchased him a magnifying glass, and we wrote down our observations of the dead bees. 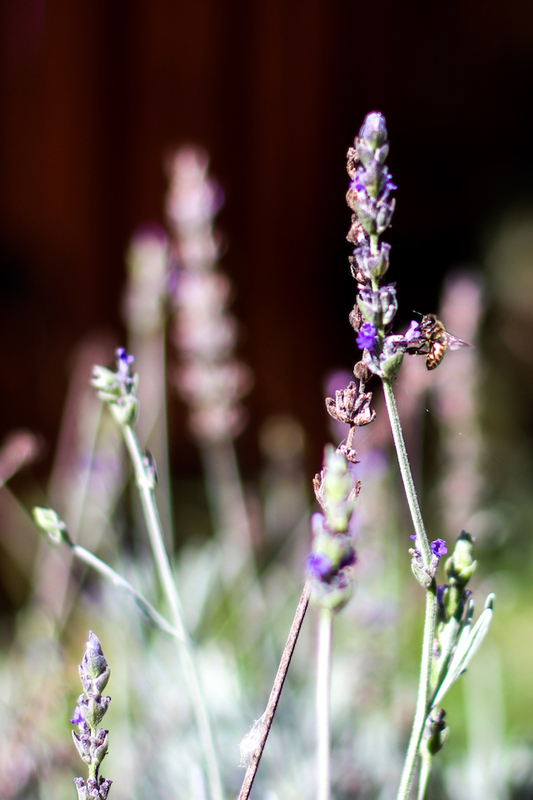 Then, we went outside and studied bees on our lavender plant, which I took photographs of, so we could see them and make further observations (also, because I like taking photographs, I look for any chance to bring that into our lessons). 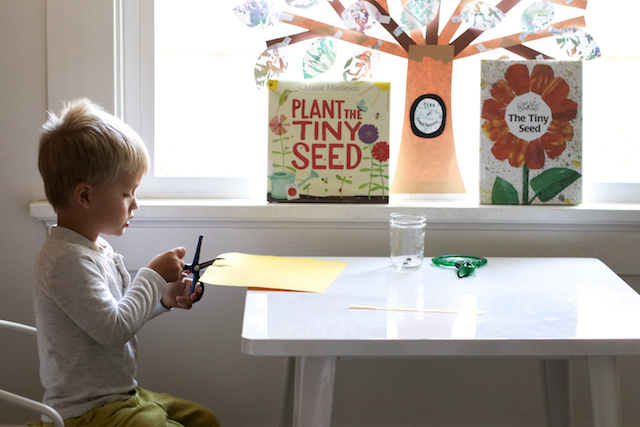 Then, we read books, and wrote down new things we learned about bees. 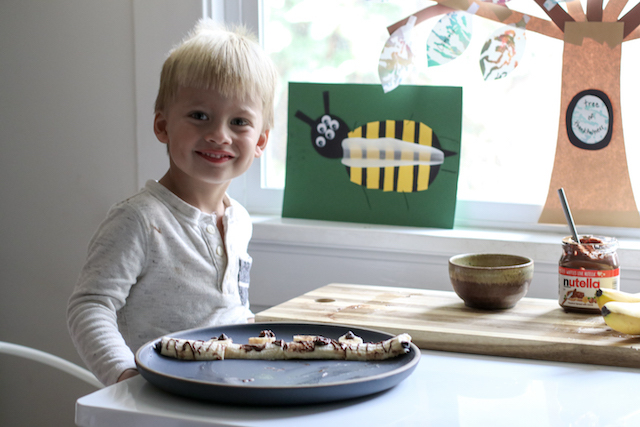 Once we had our long list of observations about bees, Everett created a bee art piece based on what he learned. 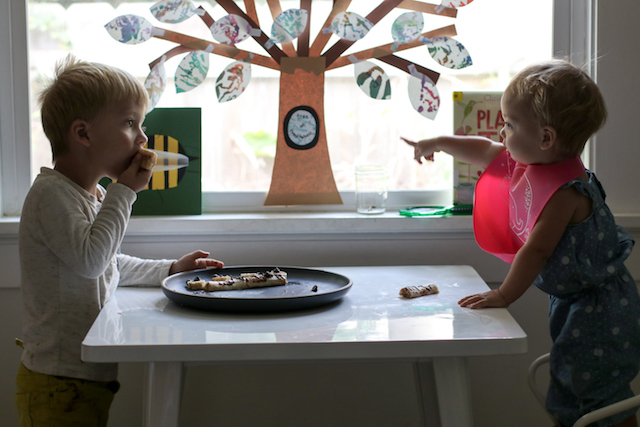 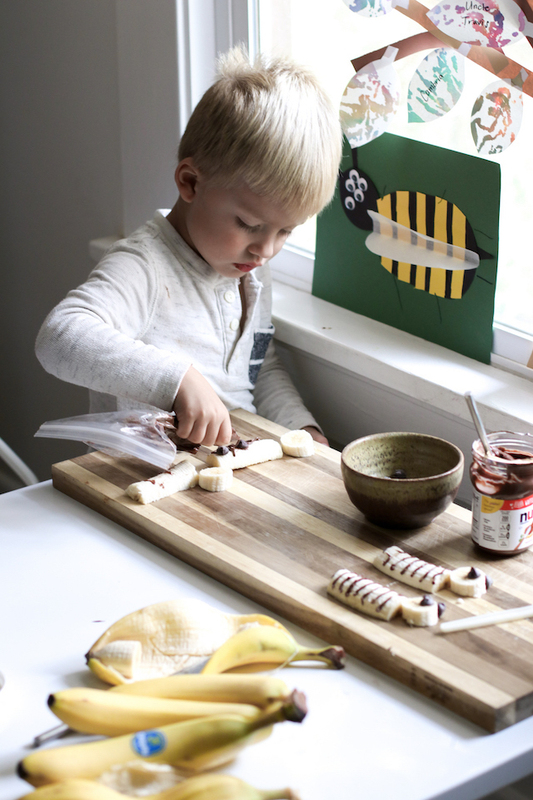 Just for fun, after that, Everett made a bee snack for Cambria and him to share. 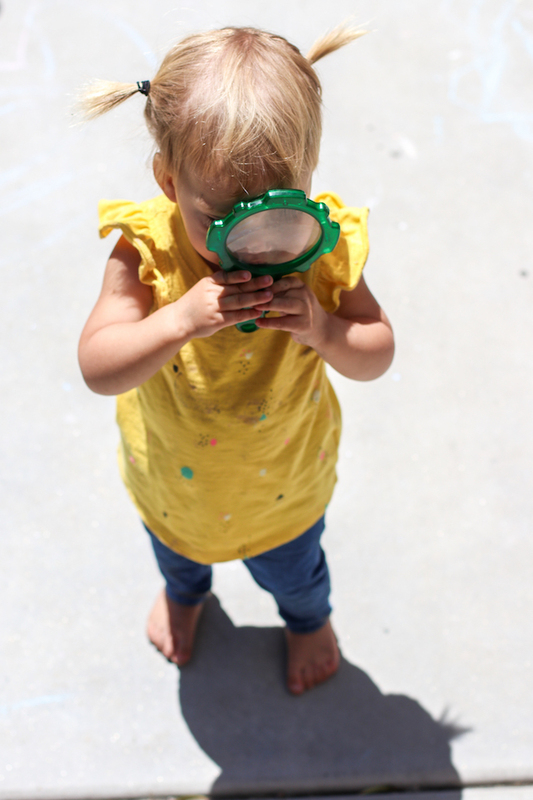 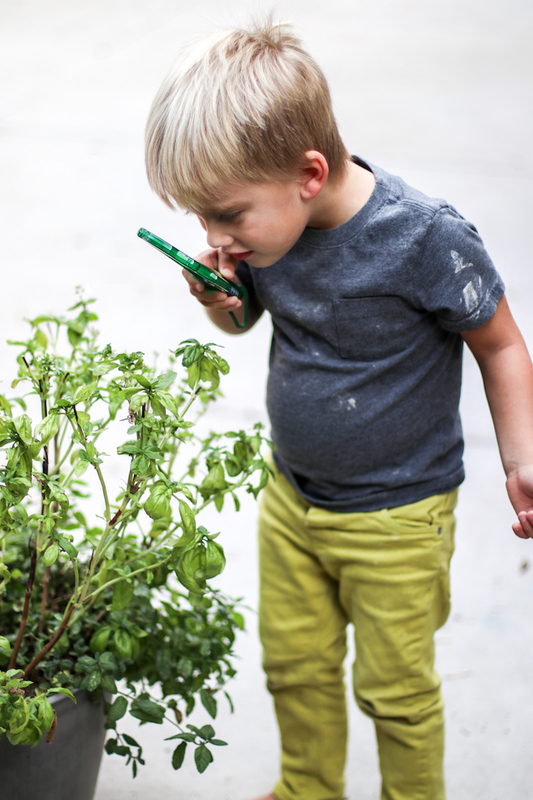 Then, we had two "grasshoppers" who lived for months on a basil bush in our backyard, so Everett would use his magnifying glass to study them. 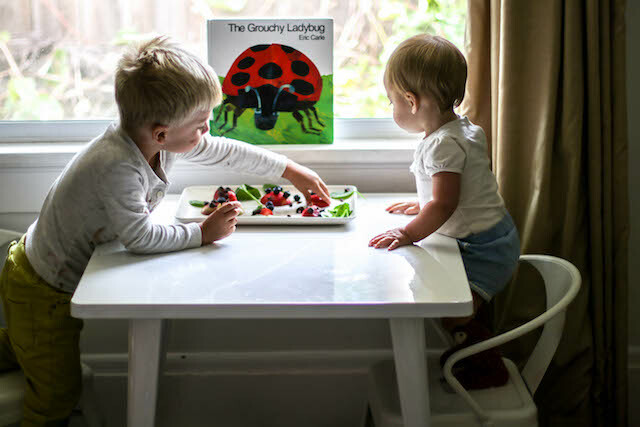 He even named them Arlo and Robby. 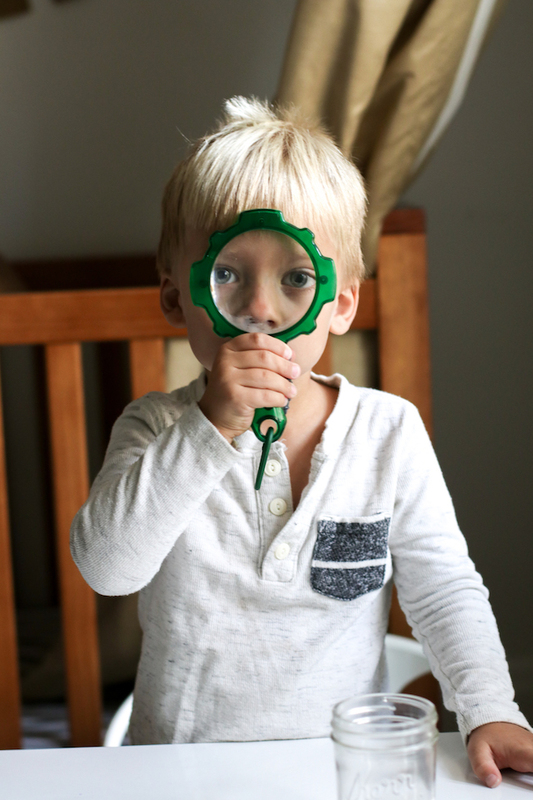 Every day, he would go and check on them with his magnifying glass. 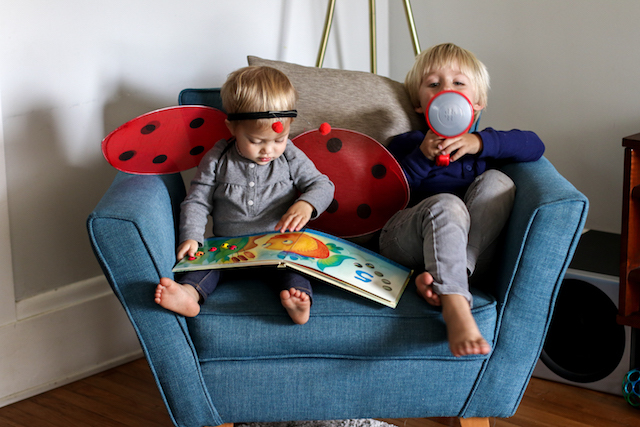 We checked out some grasshopper books from the library, only to learn that Arlo and Robby were actually bush crickets, which kind of devastated Everett. 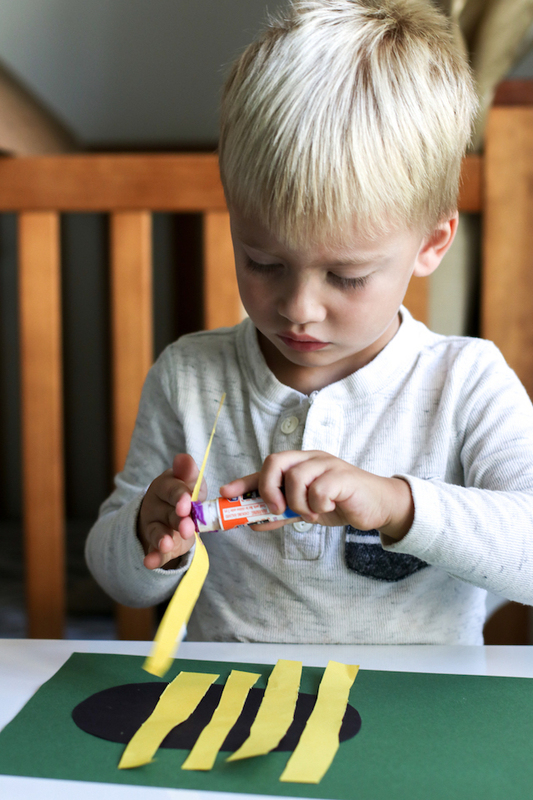 They eventually moved on from our backyard, so we created a cricket out of a clothespin and pipe cleaners that Everett could keep, and he named him Vavo. 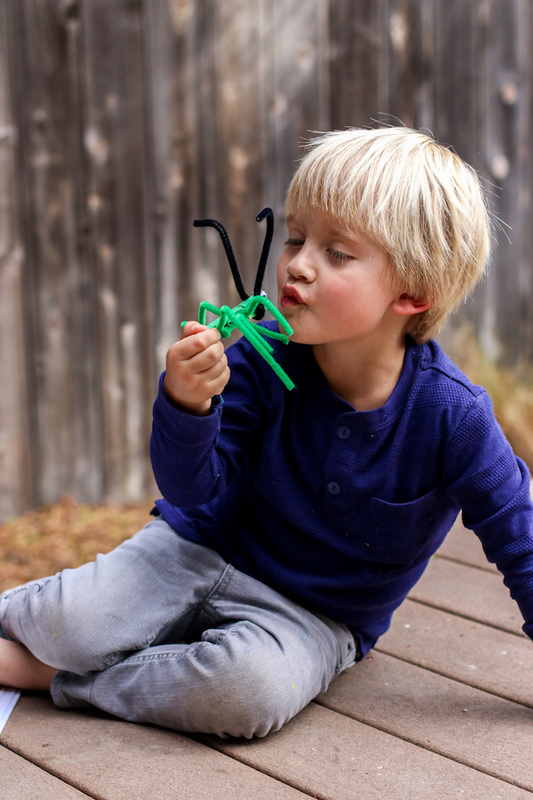 He has a serious love for Vavo, which makes me think that my kids should make their own toys more often. 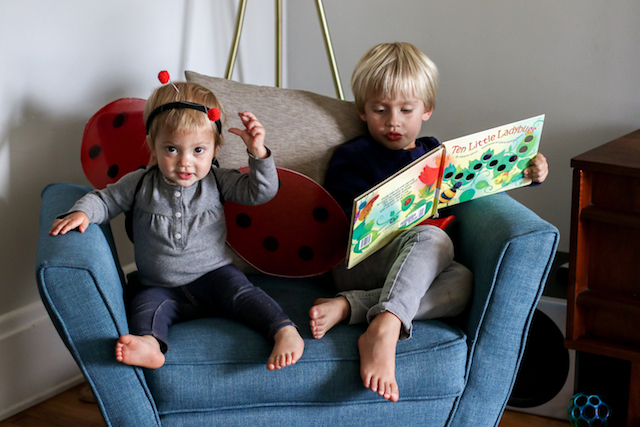 Everett asked if we could get some library books about ladybugs. 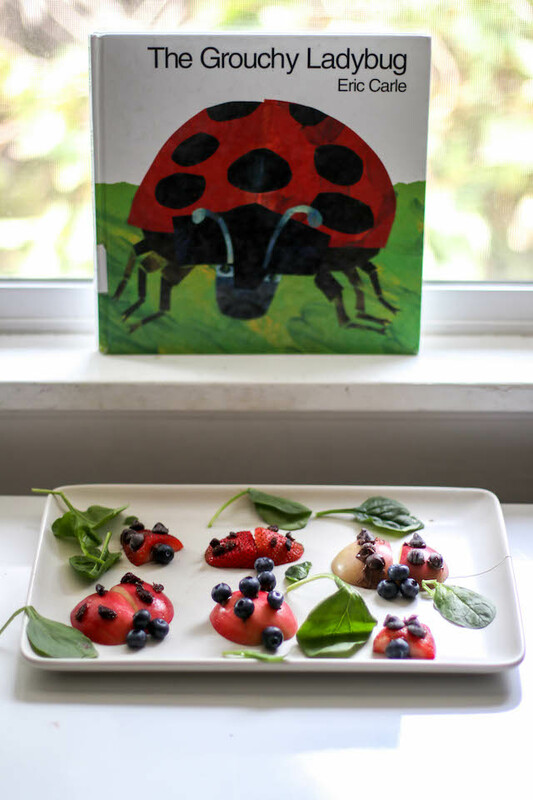 We made some ladybug snacks for fun. 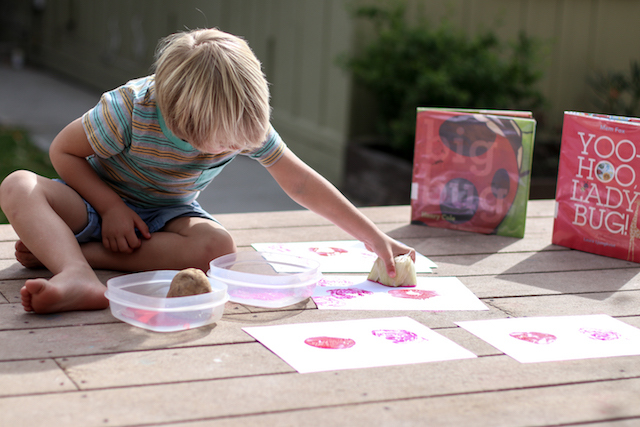 We did some ladybug art, using potatoes to stamp a ladybug's body and the end of a celery bunch to stamp flowers. 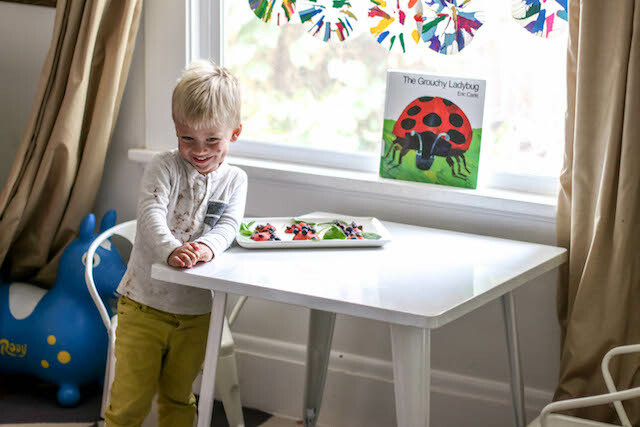 Then, Everett used q-tips to paint black dots on the ladybugs to create their spots and yellow dots on the flowers to create pollen. 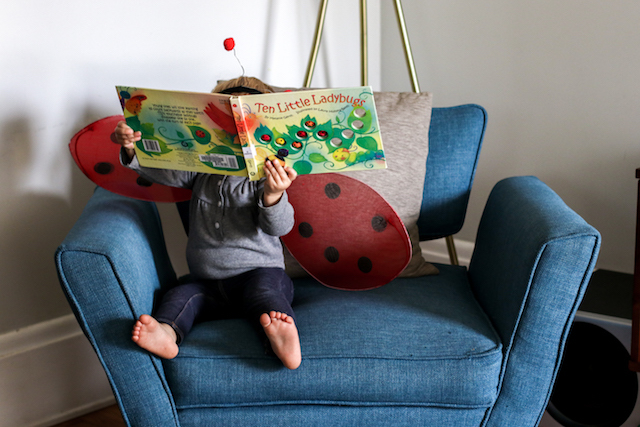 Three of the ladybug books we checked out from the library had a ladybug to find on each page, so one of the activities we did was to play hide and seek with the ladybugs in the backyard. 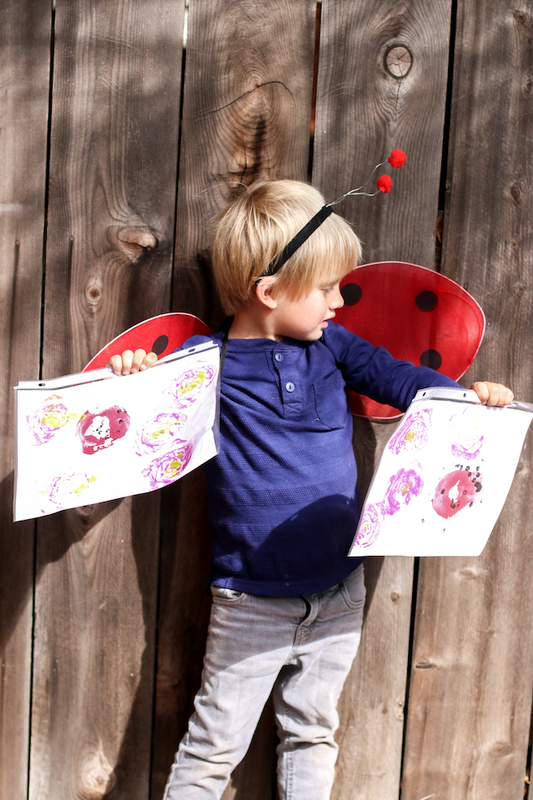 We put the ladybugs Everett created in page protectors and took turns hiding them and finding them.